One of the many fascinating things I learned during my conversion optimisation education was the relevance of the Fogg Behaviour Model (FBM) to ecommerce.1 The model helps us to understand why website visitors do or don’t do what’s expected of them. This was a revelation to me. It really opened my eyes to how psychology has such a vital role in everything we do and the choices we make when we are shopping online. It’s a interesting area that I believe ecommerce companies should seek to understand as it will give them a greater appreciation of how people think and behave as well as being able to recognise their motivations for coming to their websites. And, importantly they need to understand what we can do to affect their behaviour. BJ Fogg founder of the Persuasive Technology Lab at Stanford University in California, USA, who I had the great pleasure of interviewing (summer 2015), developed the model. In a nutshell his model enables us to organise psychological theories to better understand how they interlink. BJ Fogg states Behaviour = motivation + ability + trigger, or B = mat. All of those elements must happen at the “same moment” to elicit the behaviour. And, it is with that understanding we can utilise the FBM in context of conversion optimisation. Looking at Figure 1, to maximise conversion opportunities we need to provide (or appeal to a state of) high motivation, an easy to do procedure, and relevant triggers. Get those three things right to get high up on the right hand corner of the chart. Let’s break this down. What behaviour do you want? Translate target outcomes and goals into behaviours. How can you make the behaviour easy to do? What will prompt the behaviour? Some triggers are natural. Others you must design. No behaviour happens without a trigger. pleasure/pain—the result is immediate. People respond to what is happening at that moment and it requires minimal (if any) thought. Pleasure might be easy to identify in terms of a customer finding exactly what they wanted on your website and then buying it (easily), but pain takes a bit more thinking about. Think about the things we don’t really care to buy but have to—insurance, etc.—and then turn it on its head and make the experience pleasurable. Note the rise in all those comparison websites—although we don’t like spending money on insurance, but we know we need it, so we look for the best deals and feel pleasure in getting a policy at a competitive cost. The simplicity of your website tasks will have an immediate effect on ability of your customers to accomplish what they want to do. Well motivated, they land on your website and so they should be able to perform the task without having to learn a new way of purchasing, for example. In reality, the scenario should flow easily: they came, they saw, they bought—and all without having to conform to a host of special requirements that they need to think about. As BJ Fogg says, “In real-world design, increasing ability is not about teaching people to do new things or training them for improvement. People are generally resistant to teaching and training because it requires effort.” So, anything you want your website visitors to do—and, indeed, any task they choose to do voluntarily—needs to be easy for everyone regardless of their personal abilities. The words of Steve Krug, “Don’t make me think”, are highly appropriate in this context. So your website call to actions are triggers. Make them appropriate to your customers needs—and use them appropriately by placing them in front of them at the right time. Clearly, not everything will be a “buy now get 15 per cent off” situation, because the larger the purchase cost, the more nurturing you’ll need to do—so you may need several triggers to complete the process, for example a main button CTA supported by a “Free Delivery & Returns” text link positioned nearby. And, you’ll want to trigger your customers to remember your website—so your marketing campaigns need to be appropriate too. Sending out personalised emails about new and seasonal products, special offers, etc., at appropriate times of the year keeps your website in their minds. Just ensure those trigger emails match the triggers on your website too. Carry the personalised experience across where you can. 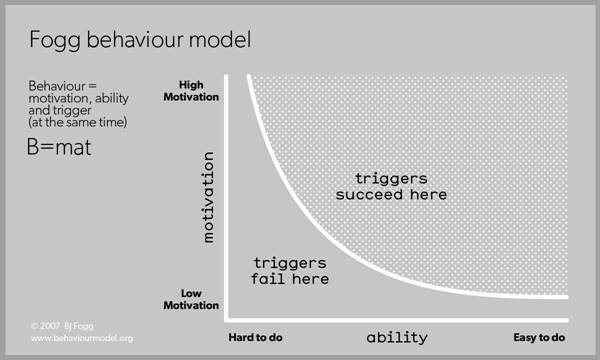 Now that you understand a bit more about motivation, ability and triggers we can look at what they equal: behaviour. Here’s how BJ Fogg tabulates the various behaviours. Take a look at Figure 2; for website conversions we are concerned with one-time green dot—do new—and blue dot—do familiar—behaviours. Green dot behaviour is utilised in in the initial stages of inducing complex behaviours; e.g., using a small introductory offer to establish loyalty. But, it requires the unconverted user to be able to complete the action the first time. So you have to motivate the website visitor further with your trigger, increase their ability to complete the task and highlight the benefits. Blue dot behaviours are easier to achieve than one-time green dot behaviours, because the customers are familiar with what is expected and that they understand that there are related costs and benefits. So, it’s then up to you to help them do what they want to do, motivate them accordingly, make it as easy as possible and use appropriate triggers to keep them with you. Also remember, it is much simpler to make a task easier over a longer period of time than it is to increase motivation, so focus on making things easy for your customers. Our motivation depletes very quickly when tasks become difficult, often resulting in people abandoning tasks (i.e., leaving your website without buying). And, of course everything you do can be tested and optimised further. Take a look at how you use your copy to increasingly motivate, investigate your forms—how easy are they to complete and can they be simplified to improve all customers’ ability to buy, and trigger behaviours with your headlines and call to actions. Understanding why people do things is key to optimising your website. Nearly all decisions we make are made subconsciously. BJ Fogg’s behavioural model helps us to understand why and how people make decisions. Help your customers by making your tasks as easy as possible for them to do, thereby increasing their motivation and presenting them with the appropriate trigger at the right time; at the time they are about to make that buying decision on your website. Hi, I’m Neil and I’m passionate about helping organisations grow their businesses online by applying data, science and psychology. Our company Endless Gain is central to this passion. For more than 15 years, I’ve been helping businesses here in the UK, Europe and USA grow their online profits. Today’s businesses must be more scientific in how they approach business growth and that’s where we can help. In addition, our approach to conversion optimisation enables companies to maximise their marketing channel investments.